I most likely, if I ever get hitched, will not go red down the runway. (Most likely.) I believe that would do my father in, and he’s been far too good to me to go out like that. 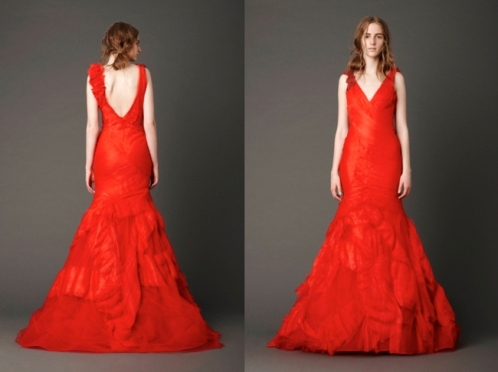 Howeva, I swoon for this red concoction from Vera Wang’s Spring 2013 collection. I’m totally on board for something in the cream family. The drape and the back are to die for. I love that she’s gotten sick of sending 30 white dresses down the runway every season and instead has been offering these really dramatic gowns in black (!) or red (!!). I like the idea of doing something different, maybe color or length, Oscar de la Renta even sent pants and a crop top down his Bridal runway this week. I think it’s far more acceptable to take a risk these days, and though I probably would shy away from a crop top or vixen red I might someday go for a lovely lilac or some such. This is astounding! I am relinquished the framework for this shocking . I've dissected an expansive measure of articles, regardless this is one of the best ones that I've inspected. Continue giving more articles along these lines. SedoSedo takes a commission on courses of action made through them, yet all exchanges are dealt with through escrow. In the event that you are not searching for a super-smart game plan. The following stride is to include stage change materials for fleeting vitality stockpiling (cooling amid the day and warming around evening time) and also geothermal to store summer heat for winter use. It's from the Aladdin Regular time. However the social event Aladdin run of the mill is a further movement of Ziggy, which is clear in his appearance and persona. Accreditation and Information Steadiness - Give a social affair of affiliations that upgrade and ensure the technique for information, or its setting, for business key force. Yet, your most solid option would be to have this discussion with your Post trial supervisor to perceive how it influences your future. You got truly fortunate however. Good fortunes. unquestionably wrap bunches of fabric from the roofs and notwithstanding hanging down the dividers, ideally fabrics like silk, glossy silk, and a blend of intense reds with bohemian examples spotted with gold sparkle. So this differential heating and cooling causes air currents to set up, especially at boundaries between water and land masses. during the day warm air over the ocean rises, cooler air from the land moves in to take its place, this is an ocean breeze. At night the warmed land mass now heats the air above it and cooler air from the ocean moves in to replace it.....an ocean breeze. This leading software provider keeps many photography resources here. Professionals can get a gallery on the works of others, along with videos. There are also articles, resources, and a blog with more. Very interesting and useful post. good work. Thanks for sharing this useful Blog keep it up we supported you.